The 39th annual St. Petersburg Power & Sailboat Show wrapped up the fall 2016 show season on a high note Dec. 1-4 at the Duke Energy Center for the Arts Mahaffey Theater Yacht Basin and Albert Whitted Park in St. Petersburg, Fla. Attendance increased by 5 percent from last year, capping a strong fall show season that saw only one minor bad-weather impact (Annapolis contended with Hurricane Matthew in early October, a storm that also took a swipe at Tampa’s October IBEX). Companies such as MarineMax rode a strong showing at the Nov. 3-7 Fort Lauderdale International Boat Show into the early-December St. Pete show. “Dealers and manufacturers are excited about the mood,” Daniel Grant, Show Management media representative, said at the St. Pete show. Show organizers were thrilled to see a line at the gate on opening day and steady traffic during the traditionally slower show days. Show Management owns and produces the show. Show Management and Soundings Trade Only are owned by Active Interest Media. Tiburon is based in Corpus Christi, Texas, and builds three models of its shallow-water flats boat with a patented keel. It recently opened an office in Sarasota, Fla., and has been attending shows on the Florida Gulf Coast for the first time. Smith says Tiburon was happy with the two Tampa shows it participated in, but the St. Pete show was by far the best. “Beautiful day, outdoors, friendly people, boat sales. Definitely what we had hoped for,” Smith said. For Chris-Craft regional sales manager Justin Short, the St. Pete show is home turf. Chris-Craft, based in nearby Sarasota, showed its new Commander 42 and Calypso 30 dual console in the water, along with several other models. Short says interest was strong across all models. Galati Yacht Sales operations manager Alex Kramer was thrilled with the weather and positive attitudes along the docks, but thought business activity was light for his company. “The show promoters do a good job, but we’d like to see even more publicity — news about what’s brand new, never been seen before,” he says. Sailboat makers have a strong history of participation at St. Pete, said Catalina Yachts materials manager Patrick Turner, but Catalina would like to see stronger show support and more show presence from Sail America. Sail America organizes the cruising seminar series and the Discover Sailing series at St. Pete. Catalina salesmen were working on closing deals on a Catalina 385 and a brand-new Catalina 425 at the show. “I think buyers were nervous before the November election, and now they’re confident and relaxed and are in a buying mood,” Turner said. 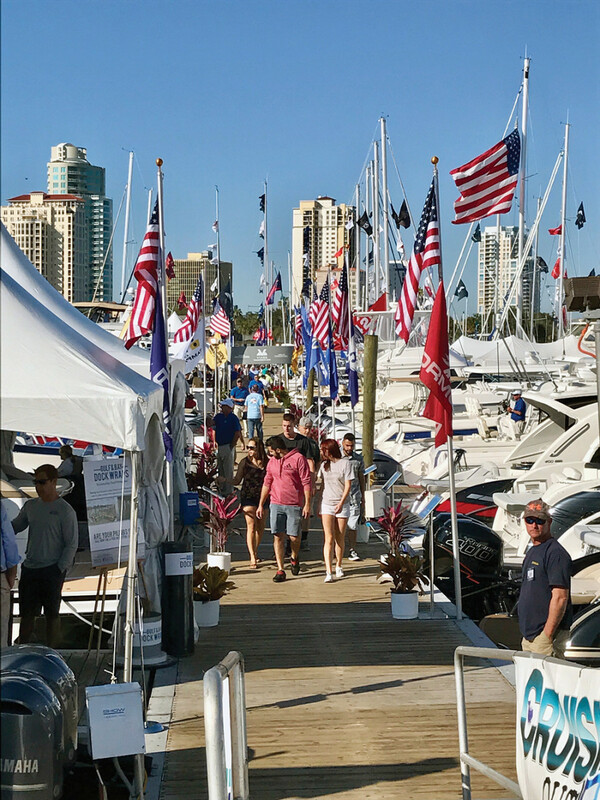 The St. Petersburg show is the largest in-water boat show on Florida’s Gulf Coast, and this year’s show had the largest footprint ever, with nearly 4,000 square feet of additional exhibit space and an 18 percent increase from last year in the number of new boats in the water. This article originally appeared in the January 2017 issue. Irwin Jacobs’ son reflects on possible motivations for the deaths. This year’s show will have 70 sailboats in the water. The Tennessee-based supplier to the marine industry expects to create 200 jobs. The division, bolstered by acquisitions, saw a 99 percent increase in Q1 sales compared to last year.